The fight-or-flight response is a key element of survival for both humans and animals, as it plays an active role in alerting individuals of suspected danger. While it is easy to understand why the fight-or-flight response exists, the science behind how it works is a little more difficult to grasp. This is why we will be outlining how acute stress response affects the sympathetic nervous system while discussing how spinal misalignment can cause your body’s fight-or-flight response to malfunction, resulting in your sympathetic nervous system to become overly exerted. Elevate Chiropractic has served the individuals of Fort Collins and the surrounding area of Northern Colorado by providing the leading chiropractic services for children, adults, and the elderly. We realize that no two patients are alike, which is why we craft patient-specific treatment plans to target the areas that are affecting you most. Our gentle Torque Release Technique is designed to make adjustments to your spinal alignment so that the pathway between your spinal cord and brain is able to relay information more effectively. Learn how your spinal alignment could be causing you unneeded distress by reading more below. One half of the autonomic nervous system, the sympathetic nervous system, is responsible for engaging your body’s fight-or-flight response. The sympathetic nervous system works bidirectionally, and can cause many noticeable internal changes. For example, when the sympathetic nervous system is active, your body will respond by constricting your blood vessels, dilating your pupils, increasing your heart rate, and causing you to perspire. As you can see, the power of the human body to adapt to stressful situations is truly incredible. However, if you suffer from a misaligned spine, your sympathetic nervous system may not be performing at its full potential. Vertebral subluxations occur when spinal misalignment is present. This can cause the sympathetic nervous system to function at a much higher rate than it would normally. The reason behind this is because vertebral subluxations are essentially stress responses, causing your acute stress response to be engaged during times when it normally would not be active. This can cause the endocrine system to function irregularly, causing the adrenal glands to secrete more adrenaline than they normally would. Side effects of subluxation are easy to spot, as you may experience increased fatigue, sleeping problems, depression, and many other undesirable side effects. 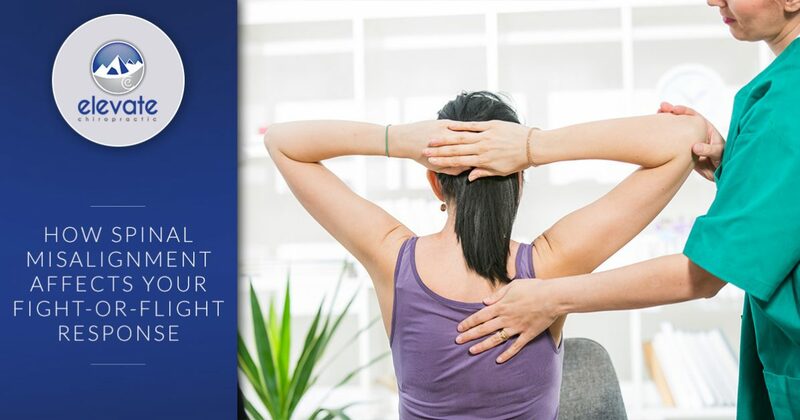 While you may be experiencing heightened levels of stress due to a misaligned spine, there are many ways that chiropractic care can help to restore your sympathetic nervous system to its optimal functioning state. Through the use of gentle spinal adjustments, chiropractors can assist in realigning your spine so that your brain and spinal cord are able to efficiently communicate with one another. The result is a happy and healthy body that is able to function much more effectively. If you feel like you may be experiencing heightened stress levels due to vertebral subluxation, stop by Elevate Chiropractic, located in Fort Collins. We have helped countless patients regain their health, and can’t wait to help you as well. Contact us today to get started!